welcome to our online shop. Please take a look around and discover the latest products from WIZnet - the hardwired TCP/IP provider. January 2019: Embedded World ahead! WIZnet has to announce the PDN for the WizFi630A. The main chipset from Ralink has become obsolete. All customers who require this product should contact us soon. We are currently working on the WizFi630S, which will be a (nearly 1 to 1) replacement module. WIZnet will have a booth (#115) at the IoT Tech Expo (https://www.iottechexpo.com/europe/) taking place in the RAI Amsterdam on the 27-28 June 2018. You can meet a part of the WIZnet Germany team there. 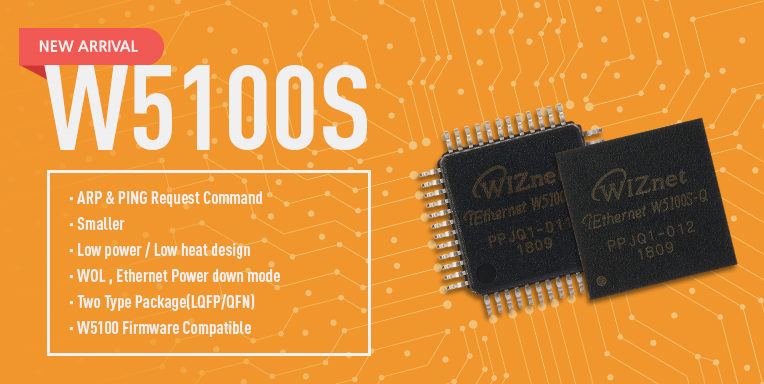 WIZnet has officially released W5100S in two versions (LQFP and QFN). It is a more cost-effective version of W5100 and software compatible but with a different pin layout. The WizFi210 and WizFi220 have reached their end of life. There is only a limited time left where all related products can be ordered. The last order date for our customers is the 30th of June 2018. Please contact us in case you have inquiries for the WizFi210 or WizFi220. In case you have any questions please feel free to contact us by mail shop@wiznet.eu or phone: +49-6239-80988-0 any time. the team of WIZnet Germany.